The following recipe is from The Foreign Cinema Cookbook, by Gayle Pirie and John Clark, published by ©2018 Abrams. While it’s not entirely gluten-free, a lot of it is, and all the recipes are superb. Here’s a lovely recipe to make when you’ve got these staples on hand and the weather permits. Plus, it’s a great get-ahead soup. Make the gazpacho several hours ahead or even a day in advance. You definitely want the soup served cold, and the flavors need a chance to marry. A chilled soup requires more salt than a hot soup, so don’t be afraid to heighten the flavors with extra salt as well as an extra splash of vinegar or a generous squeeze of fresh lime juice when it comes out of the refrigerator. In a blender or food processor, combine the tomatoes, 1 cup (140 g) of the cucumber, the bell pepper, red onion, garlic, oil, vinegar, salt, and red pepper flakes and blend on high speed until the mixture is smooth, 2 to 3 minutes. Taste and add more vinegar or salt, if you like. Refrigerate the gazpacho in an airtight container for at least 1 hour or up to 4 hours before serving. 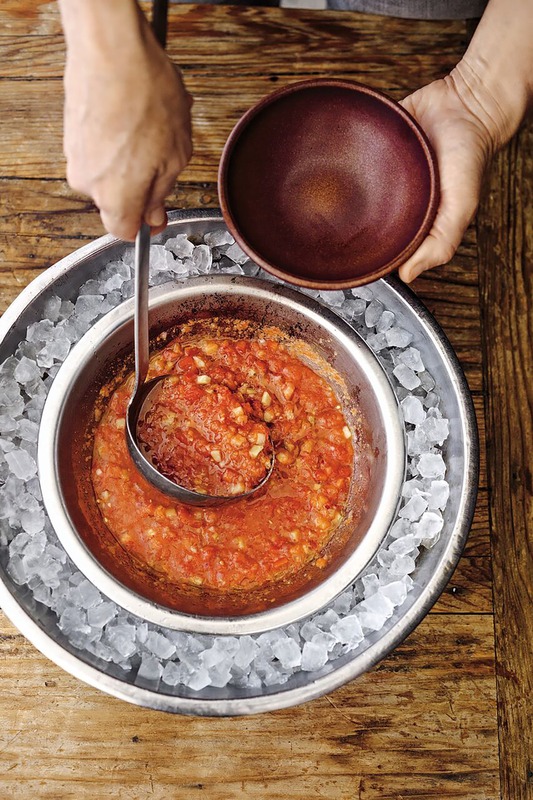 To serve, ladle the gazpacho into chilled bowls, drizzle with oil, and top with the finely chopped cucumber.